The Titans are still looking for a fast start. They didn’t get it this week. The Texans were first to score off of a field goal by kicker Ka’imi Fairbairn. The Titans’ first possession ended with a missed 40-yard field goal by kicker Ryan Succop. And cornerback Adoree Jackson goofed and fumbled during a punt return. The mistakes just get those negative thoughts creeping into your mind…”Oh no, we’re gonna get beat by the Texans when they aren’t even playing with their two best players”. The Texans were first to score a touchdown in the second quarter when their quarterback Tom Savage threw a four-yard pass to tight end Stephen Anderson. Quarterback Marcus Mariota answered back and ran the ball nine yards in for a touchdown himself after a fake handoff to running back Derrick Henry. By half-time, the Titans had evened up the score 10-10 after a field goal seconds before the half. There was some rough footballin’ going on at Nissan Stadium. Lots of injuries to both teams. The Texans lost tight end C.J. Fiedorowicz, wide receiver Braxton Miller and running back Alfred Blue to concussions. Cornerback Johnathan Joseph had a shoulder injury and WR Bruce Ellington had a hamstring injury. The Titans were without wide receiver Rishard Matthews who was out with a strained hamstring again this week, defensive end DaQuan Jones suffered a bicep tear in the third quarter (he has been placed on the injured reserve list and will be having surgery) and cornerback Logan Ryan was evaluated after a scary hit, and was out with a concussion. The Texans were essentially left with WR DeAndre Hopkins on offense. 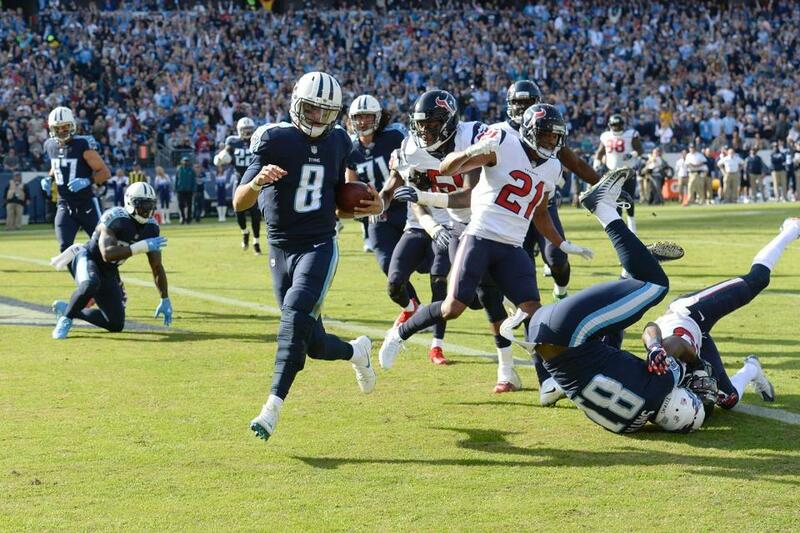 With all those Texans hurt, you would think that the Titans would want revenge on that 57-14 loss from October, right? Didn’t happen. The Titans finally got the train rolling late in the third quarter. Tight end Delanie Walker, had a 24-yard catch for a touchdown and had a lovely “burping the baby” in the end zone touchdown celebration. It was an inside joke with the television crew! 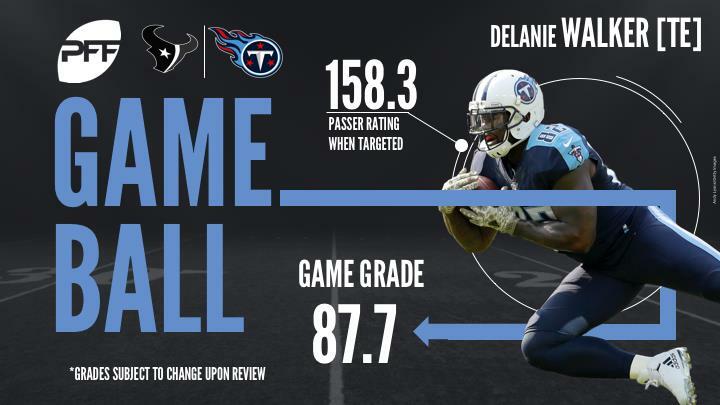 Titans: Delanie Walker (delaniewalker82) putting the team on his back. #TitanUp pic.twitter.com/vZvjWANgkp Go Titans!!! The Titans had the lead 17-10 at the end of the third quarter, but the Texans were fighting back, scoring a field goal which made the score 17-13. With Ryan out, cornerback LeShaun Sims was covering Hopkins, probably the best wide receiver in the NFL. Sims showed all of TitansNation that he can make plays! He intercepted a throw that was meant for Hopkins and saved the day. Nerve Wrecking!! Then the much loved King Henry caught a toss from Mariota and brought the win home with a 75-yard touchdown run. For the first time ever, Derrick Henry seemed happy with his TD and actually jumped up into the stands. Usually Mr. Ice Cold just hands the ball over to the referee in the end zone and that’s it. Dear Titans: Let’s make the King happy every week, then maybe we will get a few blow out games! 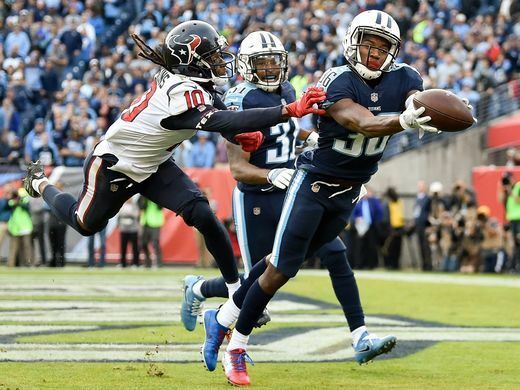 Titans players said that the hometown crowd really helped the team win; the crowd was so loud during the last quarter the Texans had three false start penalties. Houston defensive tackle Jeff Allen jumped early three times in a row. Titan fans have been criticized for not selling out the stadium and not supporting the team. The fans that are at the stadium are devoted and get that place rocking. Next up is a trip out west for two games; first against the Arizona Cardinals and then on to San Francisco to face the 49ers. The Titans are staying in the Phoenix area for the week after the game against the Cardinals instead of coming back to Tennessee, mostly to keep the team from getting too road weary. The Titans remain tied with the Jacksonville Jaguars in the AFC South. We’re still waiting for the team to be at full power. If they want to keep eking out some wins and save all their firepower until the playoffs, that is fine with this fan. 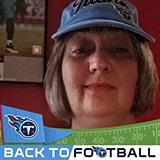 Posted on December 5, 2017 by Karen ChristensenPosted in AFC South, Houston Texans, Tennessee TitansTagged Delanie Walker, Derrick Henry, Houston Texans, Karen Christensen, Marcus Mariota, Tennesee Titans.